1. Nothing succeeds like humor in social media. 2. Testing is good, but you have to trust your instincts and be willing to take a chance. 3. Advertising does not necessarily translate to sales. In case you’ve never seen a “Dilly Dilly” Bud Light television commercial, here’s the first one which aired in August 2017. 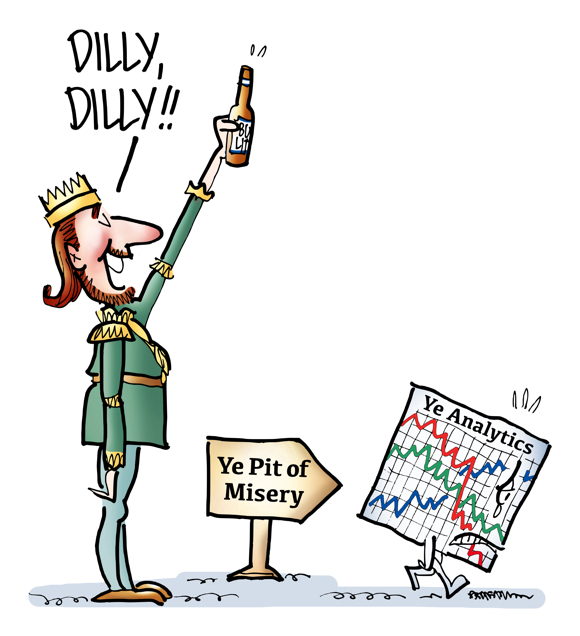 So what does “Dilly, Dilly” actually mean? But a lot of thought must have gone into it, right? The ad aired last fall during college and NFL football games, and went viral on social media. It spawned several sequels including this one which aired in Philadelphia markets just before this year’s Super Bowl. A corresponding ad was made for New England Patriots fans. Brands typically test their ads before airing them. Did the audience like the ad? Did they understand the message? Could they remember the brand and product names? So we can assume the first “Dilly Dilly” ad was a hit with test audiences, right? “We did (the) ad… because the new season of Game of Thrones (was) coming, but when we tested, it didn’t test that well… (but) we said, ‘Consumers will get it,’ especially with repetition. We have a chance here for this to become big. They trusted their gut– their instincts and experience. And it paid off when the ads went viral. Did the “Dilly Dilly” ads boost sales of Bud Light? No– at least not in the short term. Anheuser-Busch InBev had a strong 2017 4th quarter, but its North America sales dropped 0.6%, with Bud Light declining by 0.85% for both the full year and the 4th quarter. Bud Light’s volume (hectoliters) declined 5.7% in 2017. Consider these stats: In 2016, AB InBev sold 14.4 million barrels of Budweiser in the U.S. That was less than one-third the volume of the beer’s peak in 1988. Bud Light’s 2016 U.S. volume was 35.2 million barrels– but that was a drop of 15% from its 2008 high. Why the decline? A shift from “big beer” to craft beer. More ominously perhaps, Gen Z prefers spirits and wine to beer. Seth Godin says you have only two choices if you make a commodity and your marketplace shifts: run to a new market, or move as fast as you can to the high-end. Big Beer has been trying to do both in a way, by buying up craft beers. It’ll be very interesting to see how it all plays out. 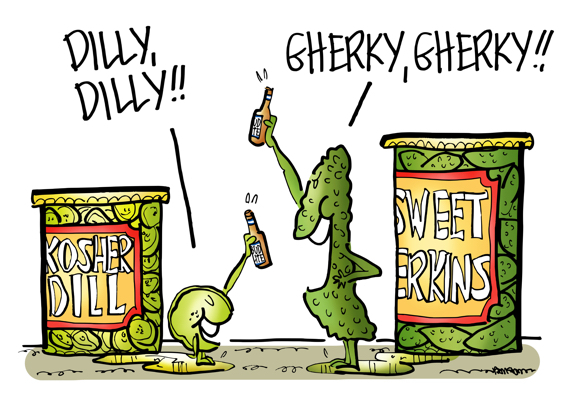 To end on a humorous note: I don’t think the “Dilly Dilly” ads are inclusive enough. They should exhibit more diversity. After all, there are many shades of green. I shall make you happy, though you’re one of the happiest guys I know! I must apologize as I so rarely comment anymore while I selfishly forge ahead for that elusive acceptance – I’m like the blind pig on the truffle farm. First, congrats on your views – well deserved – but more importantly earned – your posts are always so very enjoyable, fun, entertaining and (this is like having a good meal with free dessert!) informative. You know way back when, I went to school for advertising & design. I can’t remember if I ever told you that. I fantasized working in Ogilvy & Mather. I always adored the idea of marrying art and word together. To this day, I always try to make that creative union clever enough to be original – something more and more difficult with the reverse peristalsis of social media. But you my friend (aka funny man), have the true gift. You are an intuitive natural. I so admire your artistic talents partnered with your ‘wordsmithing’ gold. I do indeed remember your telling me you studied and worked in advertising and design. I wasn’t surprised to hear it after seeing your art and reading your companion verse. Like crossing a stick o’ dynamite with a case of black powder. “I now pronounce you T ‘n’ T …” 💥🔥🔥🔥🚒🚒🚑💨 You’re a true original all right– and so are your creations!! People like to say silly, silly words. And the ads are beautifully done, I think. There’s also something nice about beers ads that don’t depend on tall blonde women wearing their Daisy Dukes and leaning on muscle cars, or 18-hand horses dragging dusty wagons. But, gosh – that’s amazing, how they had to get past not-so-good testing. Hooray for the short term sales bump. I had no idea that “big beer” was losing market share to that extent! Sometimes the ads are so well made, so memorable, so special, that they eclipse the product. I think Geico makes great little ads. But that’s how I think of Geico: they make great little ads. Fine, if they were an ad agency. But they sell insurance. I think. Maybe the dilly, dillys were too standalone good and diily, dilly outshone the beer. Just a thought from someone who’s watched waaaaaaaaaaaay too many commercials. Wonderful post, Mark! Nothing and no one will ever outshine you! I agree with you about some ads being so entertaining, they eclipse the product being advertised. And I think it happened with the Dilly Dilly ads: they became beautiful comedy bits rather than ads. I suspect this effect could be prevented (or at least reduced) if more time were devoted strictly to the product at the end of the ad. Rather than, say, a ratio of 28:2– 28 seconds of comedy and 2 seconds of just the words “Bud Light,” make it 22:8, or maybe 22:6:2, cutting back for 2 seconds at the end to show the king holding a Bud Light and saying, “Dilly dilly!” You could still win huge points and stay memorable with the comedy, but you’d be giving the product more time to register with the viewer. Just my two beer-soaked cents, FWIW. Yes! That’d be better! My idea was way too goofy: I thought they could have someone in the ad, toward the end, toast everyone, loud voice, with “Bud Light! Bud Light! !” And then have someone else, a little tipsy, maybe, mutter, “Dilly, dilly!” Then have the Bud Light toaster roll his or her eyes and grin. But that’s too long, would add miuntes and likely wouldn’t work. You’ve hit on a key point, RK: mighty tough to squeeze an extra bit into such a short ad. Funny thing about ads: you don’t realize all the factors involved until you start analyzing them!